Earth inspired, these stunning Deluxe Recycled Wool Yoga Blankets are just what you need to show your students how much you care. Stack these warm, richly hued, 70% woven wool yoga blankets in a prominent place because they make a beautiful statement about your commitment to the environment. Our wool yoga blankets are thick and heavy, but not cumbersome. Use a blanket to assist seated and lying down poses and for savasana. Each blanket is 88"x65" with finished edges. Add extra comfort to your yoga routine with this high quality blanket. 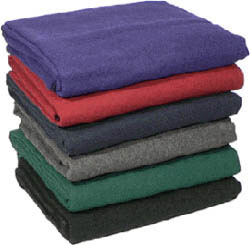 Our wool yoga blankets are solid, heavy blankets, and are available in 6 colors. The blankets are woven, and each has a nicely finished edge on it. The blankets can easily and safely be washed in a regular washing machine. Use this blanket for warmth, comfort, extra padding, or to lend support for yoga positions. Each blanket is 88'' by 65''. Very nice heavy yoga blanket - or anytime blanket. My brother-in-law saw it and asked for one for Christmas for his bed. I use 2 of these to help with shoulder stand. I have not had a chance to put this to the use intended for yoga yet, however like the blanket very much at first glance.. it is soft and a lovely color purple seems to be good quality. Have not washed it yet, either so do not yet know how well it will hold up. (Washing something as large as a blanket by hand, which is what is recommended, is a fair amount of work- will have to be done in a bathtub. I was so happy to see that my yoga blankets were just like the ones at the local studio. I would highly recommend Yoga Direct. These blankets are lovely- soft and not stiff- but with enough substance to use for support. I washed in cold H2O- and hung to dry overnight, then a quick fluff in dryer and all set to go. They arrived much faster than I anticipated as well! Definitely recommend the blankets and Yoga Direct! Thanks! These blankets are great! They are actually better than I was hoping for and I am so happy I purchased them.